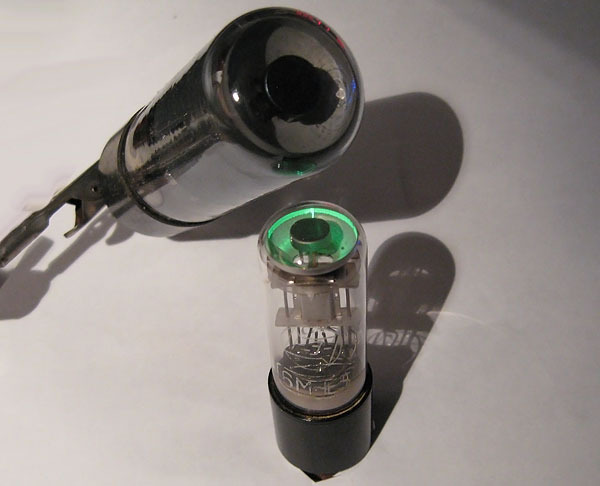 This uncommon Japanese tuning eye, the Toyo 6M-E5, is one of the smallest end-view eye tubes ever made. The 6ME5 is tiny, only 18mm in diameter, and is utterly dwarfed by traditional tuning eyes like the 6E5. 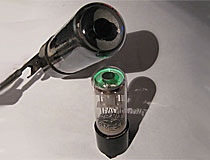 Even the base of the tube is shrunken: the tube's seven-pin button base is fitted to a phenolic cup, mimicking the appearance of much larger tubes. The 6ME5 is rare but not unobtainable. While technically not the smallest end-view eye tube ever made, the 6ME5 is the smallest end-view tuning eye the average collector will ever have a chance to possess for themselves.